Ugly, creepy pictures. Ugly, stupid, design, including skritchy font, some words in ALL CAPS, and oversize dimension. Lame fable with the message spelled out at the end, just in case the toddler can't figure it out. Too bad; I know Ward can do better. 3.5 Stars.This was a very sweet and lovely story about the man in the moon and his little moon dog. It was a precious short story about their friendship with beautiful illustrations that capture the imagination. A fantastic one for the kiddos! After our success with Ward's "Unwitting Wisdom: An Anthology of Aesop's Fables," I put several of her books on hold at the library. Her illustrations were so good in UW, I was surprised to find that many of her books are illustrated by other people. Little Moon Dog is illustrated charmingly by Wayne Anderson, but I would have rather had Ward do it. In any case, Logan enjoyed it. He doesn't read, but he goes through the books first and tries to figure out what the story is about. He was confused because the cover shows the dog and some smiling fairies offering him cakes, but the fairies on the inside looked "mean and mad." We talked about how fairies usually have their own agenda and like playing tricks. When we read the text, he was relieved that the fairies weren't really mean to Moon Dog, just mischievous. As it says on the flap, "Helen Ward thinks it's important to know that fairies make very unreliable friends. The first fairy Wayne Anderson encountered was Miss Mint, a harmless and charming aerial artist. But beware of the fairies in this book--they are NOT harmless or chamring in any way!" Fantastic! A fairy book that boys could love too.... The Man in the Moon and his Dog live in peace and quiet for most of the year, except when the noisy, naughty fairies come for their annual holidays in the summer. A beguilingly simple tale, but with many hidden messages. New friends aren't always what you think they are, or indeed what you want or need. Your old friends will always love you and take you back. And a fat dog with fake wings is always going to be funny. Wonderful illustrations filled with great detail for little kids to pour over and notice all sorts of things. 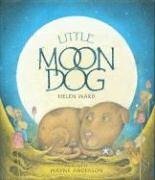 My Australian copy is just called Moon Dog, not Little Moon Dog, but is obviously the same book. Little Moon Dog and the Man in the Moon always hunker down to wait out the arrival of some very naughty fairies on their summer vacation. But Little Moon Dog is getting bored of hanging around the house without anything to do. So out he goes to play with the fairies. He has such a good time, that he ends up going back to earth with them. But once home again, the fairies loose interest in the little dog because they are too busy causing mischief elsewhere. Luckily, Little Moon Dog has a faithful friend in the Man in the Moon who comes looking for him.Soft, ethereal illustrations. Yes, I even like to read children's picture books sometimes too. I thought this one was really good. It had a very good story, a good moral to the story. It was very nicely illustrated too. I would recommend it for any child. Odd story about the Man from the Moon, some troublesome fairies and a little Moon Dog who wants to have fun. The illustrations are luminously whimsical, yet almost eerie. The overall message of the story is about faithful friendship and companionship. I have read this book aloud to my 10 grands and last night to my great niece in my camper. It is a sweet story with a message. The illustrations are beautiful. We never tire of reading this story over and over. But only on camping trips. The best part of this book for me was the pictures. Absolutely beautiful. The story was good too, with a good lesson for the kids. Little Moon Dog plays with the mischievous fairies who come to tour the moon, but he later realizes that the Man in the Moon is his true friend. Helen Ward Wayne Anderson - Helen Ward won the first Walker Prize for Children’s Illustration and twice won the British National Art Library Award. She has also been short-listed for the 2003 Kate Greenaway Medal. She lives in Gloucestershire, England.